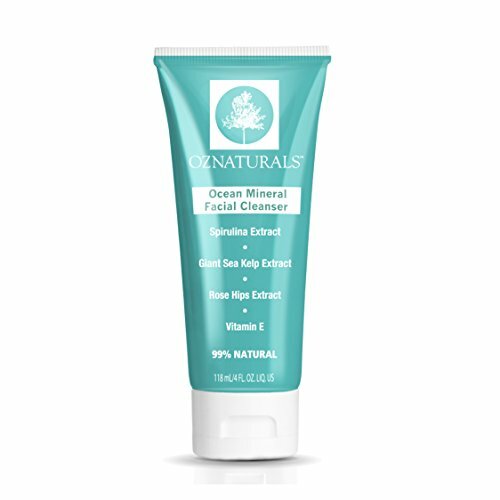 OZNaturals Facial Cleanser - This Natural Face Wash Is A Superior Cleanser That Deep Cleans & Unclogs Pores With Ocean Minerals, Vitamin E and Rose Hip Oil For That Healthy, Youthful Glow! Clean skin is healthy skin. Choosing the best facial cleanser is the vital first step in a skincare regimen that will deliver healthy, beautiful skin. Proper cleansing clears your pores, and prepares the skin to effectively absorb any serums and moisturizers that follow. This natural face wash also fights pollutants, bacteria and unwanted debris that harm the skin?s natural barrier and clogs pores. This restorative facial cleanser contains Vitamin E and Rose Hip Oil, along with an abundance of ocean minerals to effectively cleanse the skin. REMOVE IMPURITIES AND UNCLOG your pores with this natural yet powerful cleanser. This face wash helps eliminate breakouts while nourishing the skin with a rich combination of ocean minerals and spirulina without stripping your skin. COLD PROCESSED SKINCARE is better for your skin and provides a much more natural formulation than other so-called natural skincare brands. OZ Naturals Cold processed skincare is purer, cleaner and more efficacious for your skin. GUARANTEED TO WORK OR YOUR MONEY BACK - We're confident you'll love OZNaturals products. However, if within 30 days you're not 100% satisfied with your purchase, we'll provide you with a full refund, no questions asked. PATENTED BIOPRESERVE COMPLEX eliminates the need for traditional, harmful preservatives like Phenoxyethanol or Sodium Benzoate. Unlike 99% of other skincare brands, OZ Naturals formulas will never contain these harmful preservatives. THIS NATURAL FACE WASH CONTAINS ocean minerals which nourish and calm the skin while eliminating blemishes and uneven skin tone. Reveal that beautiful, youthful glow. Works well with Clarisonic and other skin cleansing brushes. If you have any questions about this product by OZ Naturals, contact us by completing and submitting the form below. If you are looking for a specif part number, please include it with your message.